Aside from the informative sessions, the abundance of networking sessions, and some great meals too one of the highlights of a WordCamp for me is something called The Happiness Bar. The Happiness Bar doesn’t serve up your favourite alcoholic beverage, but it does quench your thirst for knowledge. Staffed by volunteers (actually, everything at WordCamp is volunteer), the Happiness Bar is a place to drop in an ask any questions you might have about WordPress. You get to help. I volunteered for two one-hour shifts at the bar on the weekend, and was able to help a food blogger migrate her website from wordpress.com to a self-hosted solution, giving her the flexibility to do more with her site. I was also able to teach an aspiring developer a few tricks to writing cleaner code. You get to see some of the great projects that people in the community are working on. You end up learning some great tips and tricks from your fellow Happiness Bar volunteers. 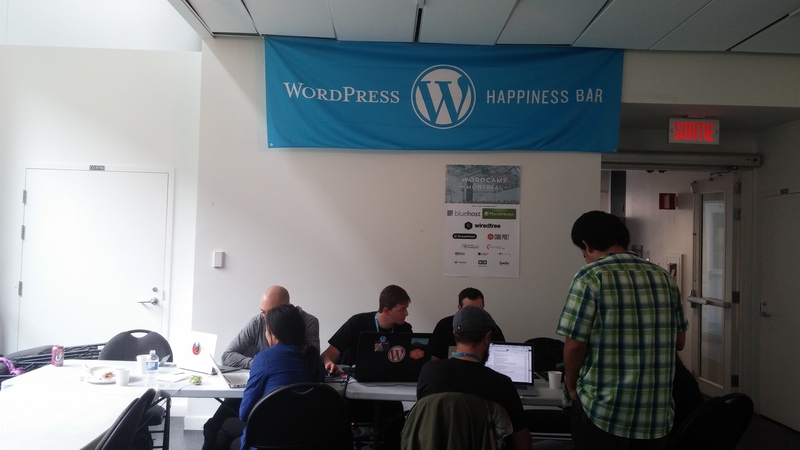 If you’re attending your local WordCamp, I suggest you take the time to visit the Happiness Bar – either to ask a question, or to lend a hand.